Label Rouge traditional quail are small hardy birds that are original products traditionally served at parties and celebratory events and used in many regional gourmet dishes. Thanks how they are reared in percheries, consumers can appreciate their delicate flavor all year round. Breeds are selected for the quality of their meat. They have grey, “wild” bird type feathers. 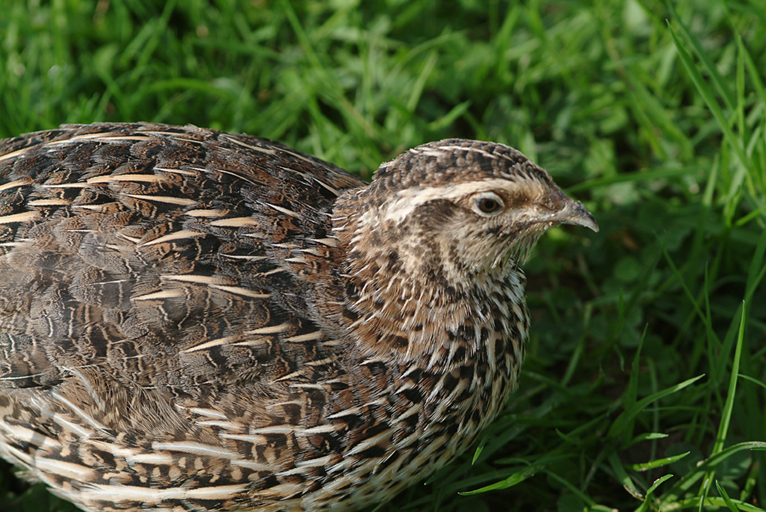 Quail are reared in small, well-lit poultryhouses (400 maximum) in natural daylight, and are let outside and allowed free access to a perchery as soon as they are 30 days old. The perchery must cover at least 100 m² in surface area and be 2m high. The maximum stocking rate allowed inside the poultryhouse is 62.5 quail per m². At least 70% of their feed during the fattening period must contain cereals. Label Rouge traditional quail are not slaughtered until they are at least 42 days old. Label Rouge traditional quail are class A fowl (European standard pertaining to external appearance) and must therefore be perfect in terms of their presentation. They can be presented partially eviscerated (with giblets), ready-to-cook, with or without their heads. As ready-to-cook fowl, their mean weight is 150 g.